A straightforward Church Micro which is a short walk from the church. 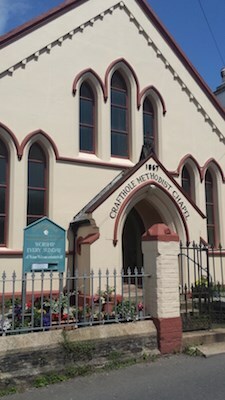 Since 1795, Crafthole Methodist Church has provided the local community with both a Christian worship centre and a valuable venue where a variety of organisations have been able to hold meetings. The Church building was completed in 1867 and comprises a venue for worship and, on a lower level, a room of about half this upper area, generally referred to as the “ Schoolroom”. This is used by a thriving Sunday school, various Church clubs and societies and for all the table tennis matches. The building was modernised by the addition of a toilet and kitchen in 1983 and in 1988 two coloured glass windows were installed behind the pulpit. Between January and April 2002 further alterations were completed giving access to both levels by an internal stairway and stair-lifts for the disabled. It is generally agreed that the Church provides a Christian witness in the area and plays an important part in village life in addition to providing a venue for worship, despite a small Church membership. The headline coordinates will take you to the church itself where your quest begins. Parking can be tricky in Crafthole especially in the summer time but you can usually find a roadside spot to park in or the car park of the nearby hostelry if you are stopping for a drink or something to eat there. The cache is a 10 cm long plastic tube wrapped in camo tape.. Please be aware of golfers nearby at the GZ and be stealthy. There are some great views from the final location. Onfr bs cbyr arkg gb SC fvta.